Crappy Bat has broken the boundaries of the Flappy Bird genre. Don’t just flap, it’s more fun to bomb! More fun, more challenging, and WAY MORE addicting than just flappy games! Those crazy monsters better watch out for Crappy Bat! He can fly through castle pipes better than any bird, but he’s a lot more fun when he drops his load on those pesky monsters! 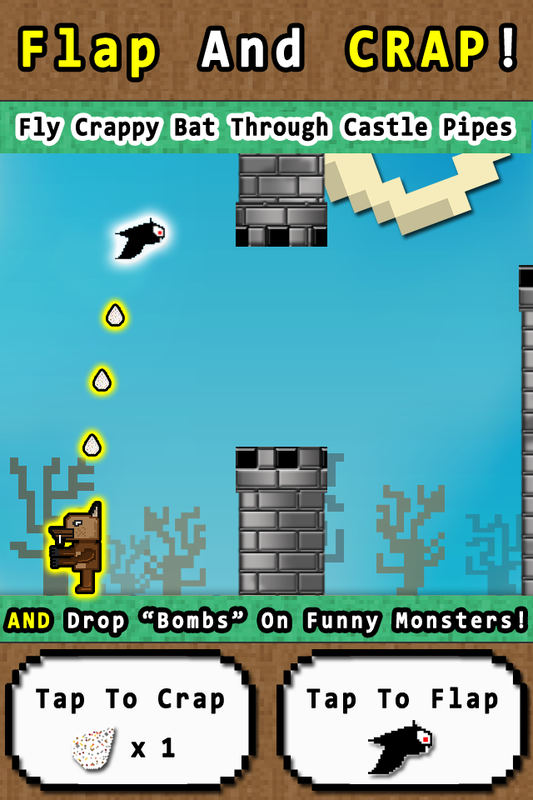 Help Crappy Bat fly through the pipes AND do his business on funny enemies! Hilarious fun that will keep you challenged in more ways than one! Squishy and squashy sound effects that will crack you up!! PLUS - MORE NEW FEATURES COMING SOON!!! !